Article Index: What is the Vogel Star of David? What is the Vogel Star of David? The symbol of the Star of David has been known for thousands of years in religious traditions, as the shield of God. More well known in Judaism, this symbol also has shown significance in other spiritual traditions such as Islam, Hinduism, and Occultism. The Star of David has symbolized protection and strength to many who wear the symbol. In Judaism, the Star of David, an extension of the Divine, or God, shielded the Biblical David in his battles. It also carries with it the number seven, six for each side, plus the center of the symbol. The seven symbolizes the seven Archangels Michael, Jophiel, Chamuel, Gabriel, Raphael, Uriel, and Zadkiel who guide and protect us. 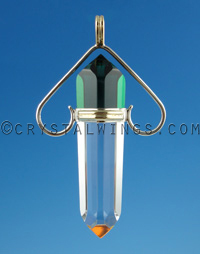 This energy of the Archangels directs us in subtle, personal ways, and protects us from attacks from darker energies. The hexagram, or 6 pointed star, is also a mandala symbol in Hinduism, that represents a perfect meditative state and balance between us, and the divine or etheric world. This represents an energy of being released from the trappings and bounds of the material world, and achieving a state of 'nirvana.' The downward triangle on the front symbolizes the sacred embodiments of the feminine, while the upward triangle on the back represents the masculine focus. These two energies intertwined ultimately represent the most powerful energy of all, creation. In the metaphysical/crystal world the Star of David gained momentum of power and use because of IBM scientist, researcher, and crystal alchemist Marcel Vogel (read What Are Vogel-Cut Crystals?). 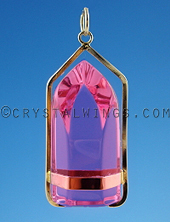 Not only did Marcel discover that quartz crystal shaped into sacred geometry wand form could induce a powerful healing effect, but that a pendant could do so as well. 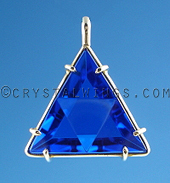 The only pendant that Marcel designed based upon the Sacred Geometry blueprint himself, the Star of David was his vice for protection and regeneration in his personal and professional life. He found that wearing the pendant allowed him to stave off energetic residue from clients, students, or his audience, while still maintaining a level of sensitivity. It has been been reported effective for loved ones, and family members that you may inadvertantly give away your energy to. This powerful Vogel Star of David pendant seems to be most beneficial for those who regularly engage with other people, whether in public speaking, sales, an active clientele, or also for those who feel extra sensitive to others opinions, judgments, and beliefs. 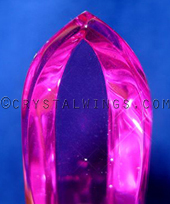 This has been found to be one of the most important tools in our medicine bag for cementing or solidifying the foundation of the self, while venturing out into the great beyond of the external world. This is no doubt a powerful energy, being that many of us become our environment, rather than bring forth our own true nature. To shine our bright light outward, we must be focused and vigilant in awareness of who we are, verses who we are in reaction to the world around us. Please see our Vogel Star of David's in the Ruby Lavender Pendant Section of our website to learn more about these pendants.